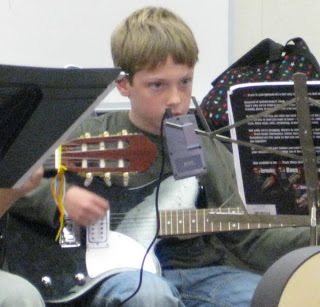 Nathan had his second guitar recital, and earned another "belt". He continues to amaze and impress us. I believe a major reason for his success is the hour of practice each night that Daddy and Nathan put into it. 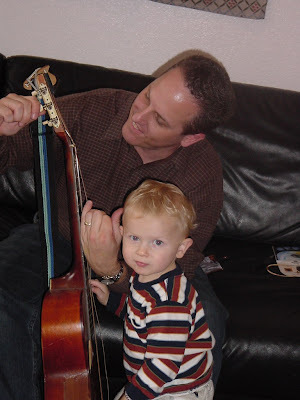 Nathan's favorite part is when Daddy gets out his guitar and they jam together. It is a huge commitment of time in an already packed schedule, but it reminds me that if you give child a choice between "quality" and "quantity" time, most likely they will pick quantity. Ask your average five or eight year old if they would prefer a single scoop of Häagen-Dazs Premium or all-they-can-eat from the Thrifty's ice cream counter, and I'm sure the all-you-can-eat option will be the one they pick. Daddy may not be made out of ice cream, but to our little boys he is just about the only thing better than ice cream. What incredibly lucky little boys we have! Thank you Michael, for all you do! 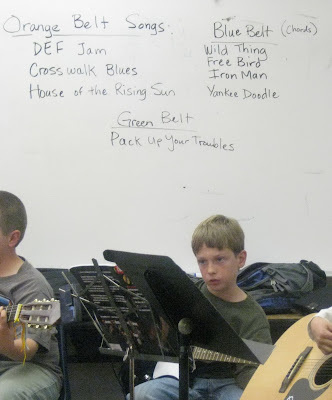 The songs they played at the recital are on the board. My favorite was Wild Thing. 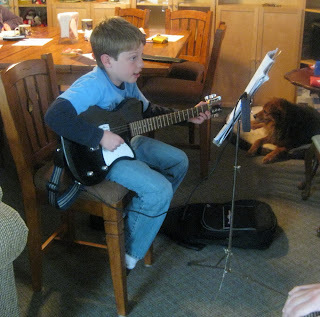 Practicing even on vacation at Grandma and Grandpa's house... You can tell he's pretty good because Tank (the dog) didn't get up and leave! And this is just too cute not to post. Daddy changing his guitar strings while Benjamin, age 1, "helps". Sweet!